Most of our Dolomite road trip days followed a pattern. Wake up in some ridiculous Airbnb, tear ourselves away for mountain vistas, and then drive on to a magical sunset somewhere else. It makes it pretty hard to piece together blogposts but there you go. Day 6 is a prime example. We had to say goodbye to our alpine chalet in Santa Magdalena all too soon, but we had an essential hike lined up in Val Gardena, followed by a scenery change around Lake Garda. This post focuses on the middle of that day which was spent seeking out a viewpoint known as Seceda. My research for our trip was mostly Instagram-based, inspired by the photography of Jona Salcher amongst others. Seceda kept cropping up in his photos (along with the Seiser Alm) and a quick Instagram search confirmed that it was a must-see place. We tried to go along on Day 4 as we drove through Val Gardena, but neither of the key cable cars were open yet for the summer (beware their opening times!). The main Seceda lift from Ortisei (St.Ulrich) is the easiest way to get to the top, but if you want to make a day of it, take Col Raiser from Santa Cristina a little further through the valley and walk to Seceda. 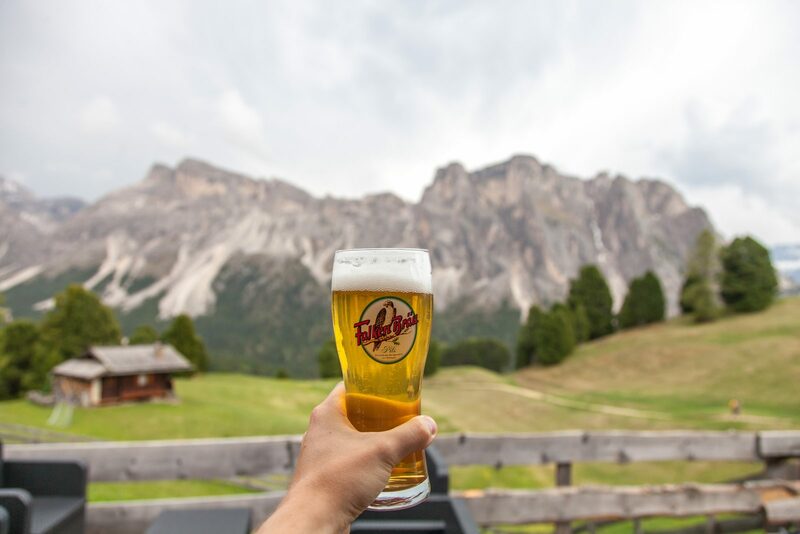 We followed a roundabout loop (details here) which took about 3 hours, ending with fresh pasta and fully deserved beer at the Baita Odles hut. Col Raiser is a beautiful alpine pasture that’s well worth exploring en route to Seceda. From the cable car (2,100m), we followed Trail #4 down towards the Rifugio Firenze which has great views out to the south. Setting off downhill in the wrong direction was a bit disconcerting, but soon enough we were back on the up, following Trail #1 in the shadows of the Odle peaks. If you need a break, stop at Rifguio Troier, a mountain hut and restaurant at 2,250m. With thunderstorms closing in on us, the Troier cabin felt like it was at the edge of the world – a bucket-list pub if ever there was one. We pushed on to the top as the heavens opened, making photography fairly tricky, though it didn’t stop some bonkers cyclists from filming a few hair-raising rides along the ridge. The scenery is awe-inspiring, whatever the weather, but I would like to return one day for a hazy sunrise or a misty morning. The walk back down to the Col Raiser cable car was much quicker than the way up, taking Trails #1a, #2 and #4a. Back in the car, we waved goodbye to the Dolomites and sought out warmer climbs around Lake Garda, but that’s a story for another post (click here). Instead, I’ll leave you with some photos from out stunning alpine chalet Airbnb where we started the day, in the hills above Santa Magdalena, the other side of the Odle mountains. Maria and her husband were charming hosts, and we vowed to return for their wedding anniversary in a few years time! If you want to stay somewhere secluded in the Dolomites for a few days, look no further. Thanks to road trip team mate Alistair Wood for taking some of the photos in this post – hover over the images for photo credit. You can follow his adventures on Instagram here.